How do you stay organised when creating content? What’s to follow, is an outline of the process that I use to stay sane (and help my clients stay sane) as professionals with a bucket load of knowledge, expertise and skills that need packaging into learning resources. If this is something you should be doing too (but are procrasti-cleaning at the thought of even having to start the process), take a deep breath and have a quick read of this article. There is hope. Believe me. I’ve spent 5 years thrashing around in my content creation jungle and I finally found a way out. You’ll read all about it below. employ someone to do it for you, just keep on creating, and LOOK AWAY NOW. If you KNOW that staying organised is the key to actually getting work produced efficiently, then read on. I’m a systems queen so can not handle disorganisation – it does my head in and there are days where I actually cannot work until my desktop (on my computer and the actual bench top) is clear of clutter. you end up chasing your tail and spending half your life LOOKING for that thing that you were working on last week – instead of actually working on it. This is NOT good for productivity and will see you wasting your time, money and energy doing things again and again simply because you don’t have a clear and simple system to follow when creating and filing documents. When you ARE organised, your productivity goes through the roof. 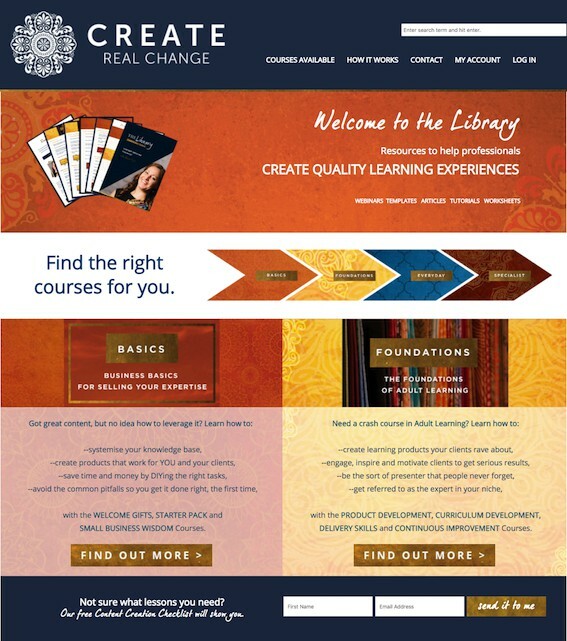 This series of emails, articles and content to support the Library and the Content Creation Quiz for example, was pulled together in less than 2 weeks (while I was also working with clients). So I think a picture essay is far more effective than me rambling. Plus, there’s a full lesson below that will take you through the whole process of getting content out of your head, and into a system that will make it easy for you to create a raft of content from it – articles like these, worksheets, tutorials, you name it. I’m just going to show you the systems I use and the process I went through to get this Library up online. It all started off with a brain dump. Yep, one helluva brain dump that literally went for 000s of rows on my original excel sheet. I’m a systems queen. It scared the living be-jesus even out of ME. The first coloured column you see was my first attempt to break my knowledge base into sections that made sense to be sold together. 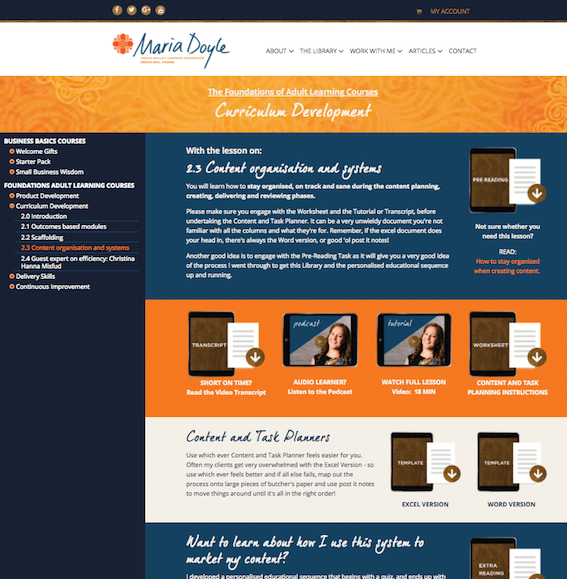 These sections now form the 4 Levels in my Library – the Basics, Foundations, Everyday and Specialist Levels. Only two of them have been populated so far. 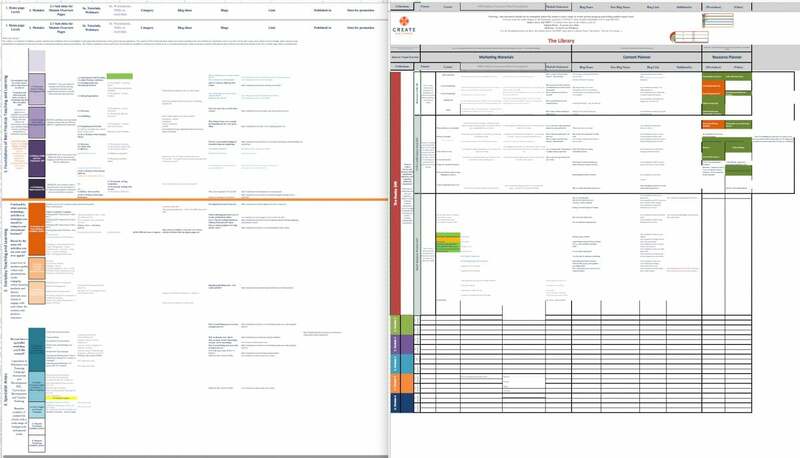 My next job was then to move it into the system that literally explains left to right, each part of the content creation process – from the marketing material needed, through to the outcomes achieved, the theory, demonstrations, activities, resources, the whole shebang. 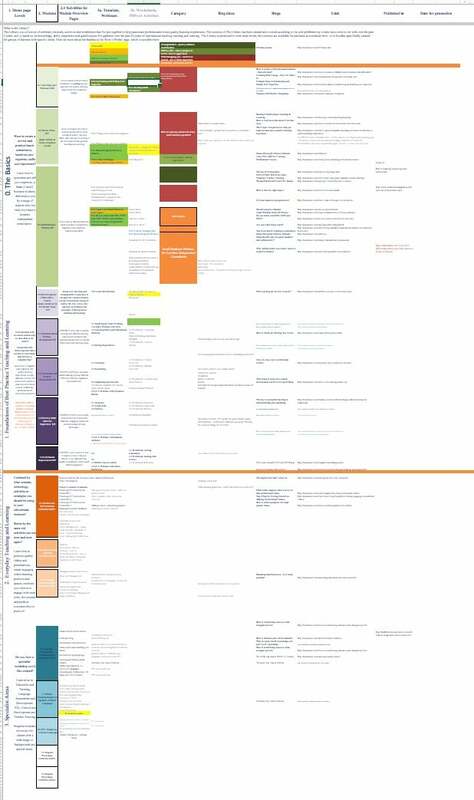 The red, orange and green sections you see on this and the previous image was my attempt to work out what I had created already, what was in draft, and what hadn’t even been started. 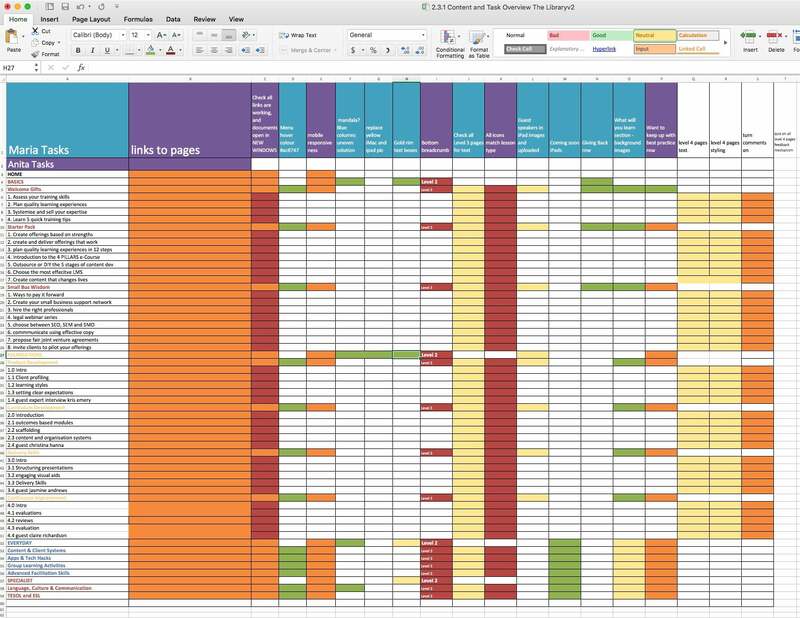 I don’t have a screenshot of the finished spreadsheet post brain-dump but all I can say is that there was A LOT of orange and red, and not a lot of green. 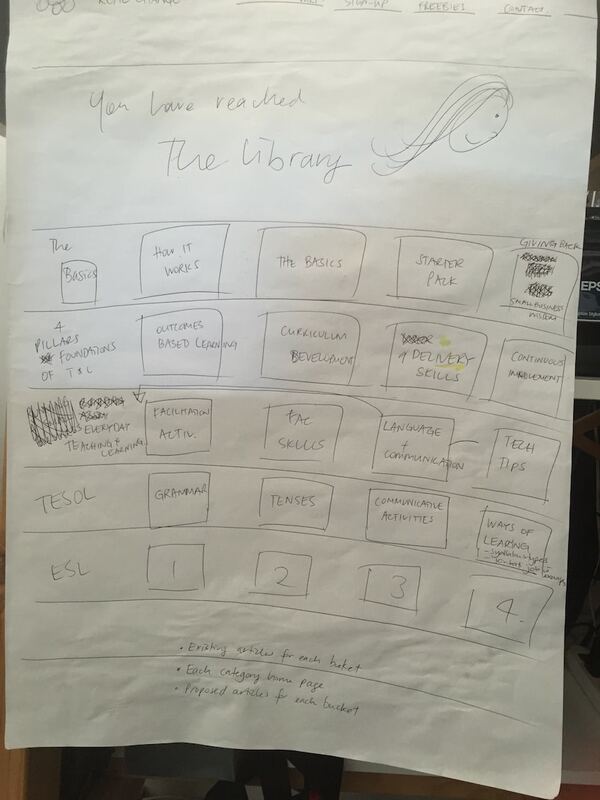 This is what the initial stick figures turned into, but not after one helluva lot of time, money and energy was spent trying to work out how to best present nearly 40 lessons, across two levels, inside 7 different courses. It did all come together in the end, and after a LOT of feedback around the user experience we think we’ve finally got it right. Thank the angels that watch over us. I nearly chucked the towel in a fair few times! Is there an even happier ending though? Yep. So now that all the learning materials are done, the system is much simpler. Each course now has a tab in one central google doc dedicated to it – that anyone in my team can access, like this one. I have 7 of these currently. What on earth is in all those columns then? every lesson is linked to an article, which summarises it, like this one. that article has a link to the full lesson (check out the full lesson below). when you sign up to my list, you do a Content Creation Quiz. Every quiz question, asks whether or not you’re comfortable with a certain outcome linked to a stage in the content creation journey like, for example, ‘staying organised when you create content’. If you answer no, or not sure to that question, you’ll receive an email that will summarise the outcome, benefits of being confident in that area, provide a link to the article that summarises the lesson, and then points you directly towards the Lesson in the Library. It’s an approach I created because every sales funnel approach I learnt about felt slimy and just NOT ME. Want to learn more about how you can turn your content into a personalised educational sequence for the ultimate trust building marketing exercise? Read about it here. That google doc with 7 tabs? It has been. Even for a systems queen like myself though. Now that I”ve got it sussed, everything works according to this system, including my Amazon S3 account, archive folders and current resources folders. When you’ve got a system, it really is very straight forward to stay organised. Ready to learn how to stay organised, on track and sane during the content planning, creating, delivering and reviewing phases? Great news. This is my zone of genius. I’ve got a live workshop coming up soon, or a bunch of self directed online resources you can access. The tutorial that takes you through my signature Content and Task Planner, complete with written instructions AND templates in both WORD and EXCEL so there’s no excuse for not staying organised and on top of your content! Join us for the workshop above, or the online resources below. Click on the above link to be taken directly to the Lesson. 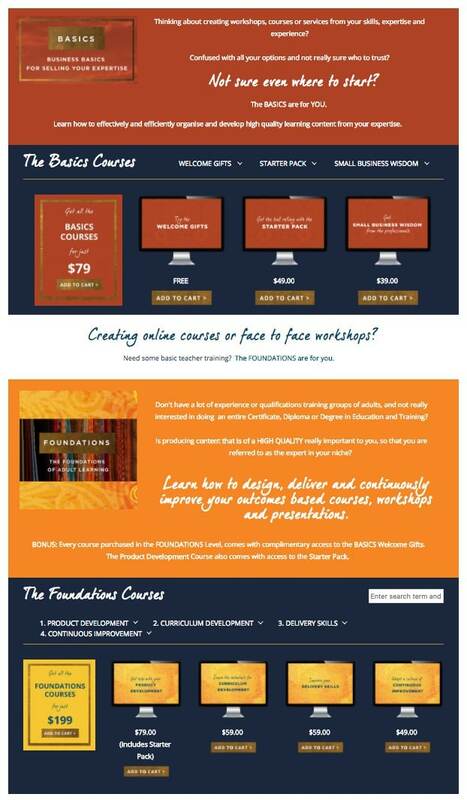 If you’re already a member of the Curriculum Development course, make sure you’re logged in! If you’re not, you’ll be redirected to the page where you can become a member. ← How much content is too much content?